Bullets and babies don’t usually mix (right, Maggie? ), but in this case that’s exactly what they do. Well kinda. The bullet part mixes at least. 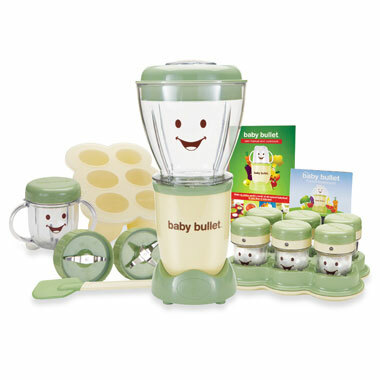 Also, the Original Baby Bullet Food Processor chops, blends and does all those other things that the harried parent might find of interest. Includes power base, milling blade, baby blend blade, batchbowl, two short cups, spatula, two stay-fresh resealable lids, batch tray, six date-dial storage cups, storage tray, pocket nutritionist and user manual/cookbook.